A pivotal document in the history of the Fraser Basin Council, and the touchstone for our work today, is the Charter for Sustainability. The Charter is a good-faith agreement signed in 1997 by a number of leaders and citizens in the Fraser Basin who believed that collaborative action is the way to a more sustainable future. The Charter was drafted by FBC’s predecessor, the Fraser Basin Management Board, and set a framework for start-up of the Fraser Basin Council. The Charter also crystallizes a vision of the Fraser Basin as a place where “social well-being is supported by a vibrant economy and sustained by a healthy environment.” Today FBC continues to support that vision across the Basin and BC. The Charter speaks to the importance of people in all walks of life understanding sustainability, caring for ecosystems, strengthening their communities and improving decision-making at all levels. There is also recognition, under Principle 11, that Aboriginal rights and titles now being defined should be reconciled in a fair and just manner. 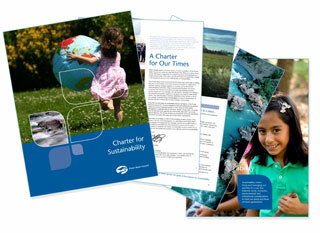 The Charter expresses a commitment to shared values. These shape the way we do our work within FBC and how we help others work together. These values are to: understand and respect the opinions of others, accept others as peers, value balance over extreme positions, take action based on consensus, and create trust among people.